Since its inception in 1996, the Multicultural Festival has grown tremendously in events, attendance, and ethnic food vendors. Tammy Curry, Program and Events Coordinator for the City of Lexington’s Parks and Recreation Department, coordinates the event each year. “I’ve seen many changes throughout the years,” said Curry. “When I became the event planner for the department, the idea was to transform Finch Park into a beautiful setting that made you feel as though you were in another country. Through sights, sounds of drum beats, and the smell of ethnic foods, you traveled beyond the park. Attendance for the festival grew dramatically when I added inflatables, amusements, community & non-profit areas, school participation, and stages in every village,” added Curry. The addition of TeenScene was very successful with hundreds attending at its inaugural event, and the Multicultural Festival has become a staple in the community. Just last year, organizers relocated the event to Uptown Lexington to provide adequate parking and accessibility. The move drew the largest crowd organizers had seen to date. Folks always ask what makes the Multicultural Festival unique to Lexington. It could be that it’s the only cultural event provided by a municipality in the Piedmont Triad area that is inclusive of all cultures. Maybe it’s the authenticity of the performers and exhibits that are provided at each village, or maybe it’s the smiles, laughter, and amazing performances that take place throughout the day. You could also say it’s the educational aspect of giving folks a look into other culture through their lives and history. Dial-Stanley continued, “It is unfortunate that many untruths, misconceptions, and stereotypes still exist about the indigenous people of N.C.” She believes that the Multicultural Festival is the type of event that showcases what makes all of us unique and productive citizens. Judy Richards, an educator, volunteer, and community advocate agrees. “I believe the Multicultural Festival to be a wonderful asset to our community in that it unites all races and cultures with the intent for each of us to achieve a better understanding of each other. It also increases the positive interaction within the community, and participants get a taste either through food or presentation of the staples within the cultures or communities that are being represented,” she said. A native New Yorker, Richards has enjoyed getting to know the people and cultures that are a part of Lexington. Richards said she grew up in the “melting pot” of New York with a diverse population that coexists in such a way that she grew to respect and value others. “I can appreciate and become a better person because of what I have learned from other cultures and races. I have become a more global thinker and understand the significance of certain traditions. I am thankful to be in a town that has that same appreciation for diversity, especially knowing that in years past the opportunities for such interactions was limited,” said Richards. As a result she has seen the festival grow and improve what is offered and the numbers of attendees. “There is something for everyone!” she said. One of the biggest draws to the festival is the participation of schools in Davidson County. “Being part of and participating in the multicultural festival benefits our community and our students. It helps build skills needed to understand different cultures through good food, good fun, and good people,” according to festival participant, Melinda Hedrick. Multicultural Festival visitors take a trip around the world in just one day by visiting five international venues that include the African-American, Asian, European, Latino, and Native American Villages. The festival also includes the Children’s International Village, TeenScene, and a community and non-profit organizations area. Each village has children’s activities, photo and interactive opportunities, cultural exhibits, and demonstrations. In addition to the villages, the festival has four cultural stages, amusements, inflatables, and a wide variety of ethnic foods and vendors. Other events provided throughout the day include the Purina Dog Show and Circus Stella. The energy and excitement as the festival draws near is always sensational. Some of the headliners for the event include the Naturalization Ceremony that will take place at 10 a.m. and the Parade of Nations which is a must-see. The Latino Village is the host leading the parade this year. Highlights for the parade include Giant Paper Puppets created by local schools, Kenya Safari Acrobats, a dragon dance, Samba Dancers and more. Thousands travel from all over the state and out of state to perform, visit, and volunteer at this family oriented event that has something for everyone. At the festival you can enjoy the sounds of music, smells of ethnic cuisine, the beat of the drums, and many interactive activities. Come join the fun and experience the Multicultural Festival on Saturday, May 6, 2017 at Uptown Lexington that continues from 10 a.m. – 5 p.m.
What are Himalayan salt and Himalayan salt lamps? Salt is one of the substances that our body needs. Salt regulates and maintains our blood pressure. It is also vital for our nervous system. Sodium chloride is essential for brain growth and the development of our neurological functions. Our adrenal glands need salt to function and the adrenal glands secrete 50 of our body’s hormones that we need! We also need salt for our metabolism and digestion. Himalayan salt is mined from the Himalayan Mountains in Pakistan. It has no environmental pollutants that can harm our bodies. Salt from these mountains dates back 250 million years. Eighty percent of Himalayan salt is sodium chloride. The remaining 20% contains 84 trace minerals that our body needs. Himalayan salt is an unrefined salt and doesn’t contain any of the chemicals found in traditional table salt. For years, many European countries have used salt mines and hot salt springs to promote a sense of rejuvenation. People rest and rejuvenate in salt mines and caves, in spa-like ambiance in many cases, for periods of time to help aid their mood and overall sense of calm. Why are the salt mines so beneficial? Quite simply, the very dry, negative ion environment of a salt mine is the key. There are many places in America where you can also enjoy salt springs or salt caves. Colorado, New Mexico, and Virginia are places where you will find natural salt springs. Manmade salt caves are also located in 57 places in the United States. It depends on who you talk to or what you read about as to the benefits of the Himalayan salt lamps. Most agree that it’s a huge chunk of salt which draws moisture into it. Once the water vapor comes in contact with the salt lamp, the pollutants are believed to remain trapped in the salt. Since the lamp is heated, the salt dries out and is able to continue the cycle of attracting water vapor and pollutants, releasing the water vapor back into the air, but holding on to the health-hazardous pollutants. There aren’t any scientific studies focusing specifically on Himalayan salt lamp benefits. 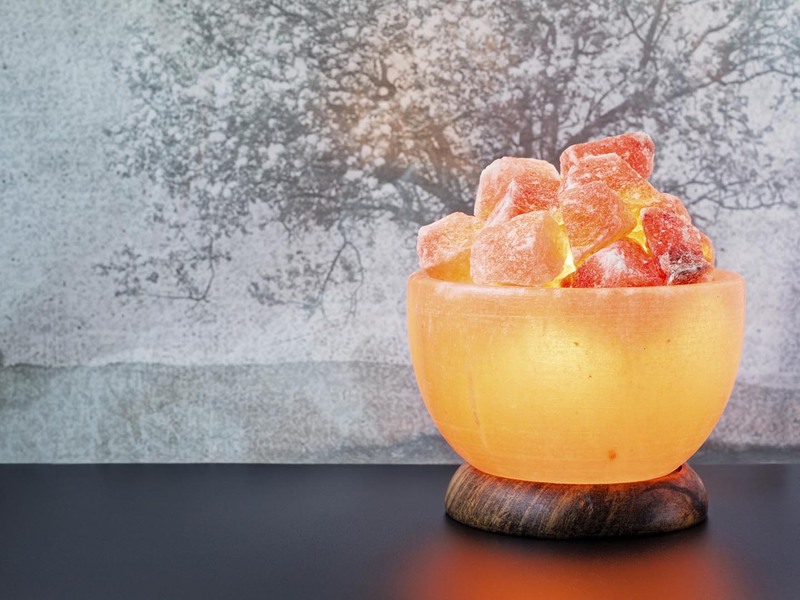 However, there is good reason to believe that a real Himalayan salt lamp may provide some health benefits given the other salt research out there, as well as many encouraging user testimonies. These include antibacterial and anti-inflammatory properties, loosening of excessive mucus and speeded up drainage, and removal of pathogens (i.e., airborne pollen). The salt lamps are believed in general to purify the air, ease allergies and asthma, and reduce electromagnetic radiation by producing negative ions to remove the positive ions in our environment. They are also believed to provide a calming effect which can boost mood and promote sleep. The Nature Cottage has recently opened a Himalayan Salt Therapy Room known as “The Zen Den.” The room contains 20 Himalayan salt lamps in various colors and sizes. We have three treatment options varying from 30 minutes to 60 minutes. The 60 minute treatment also includes a heated or cooled Himalayan neck wrap and a Himalayan salt brick foot treatment. Complimentary beverages and aromatherapy are offered as well. You can enjoy the benefits of the Zen Den by calling 336-843-4297 for an appointment. Individuals and small groups are welcome. We also sell Himalayan salt lamps that come from the Himalayan Mountains in Pakistan. They all come with dimmer cords which are UL tested for safety. Come in and see the variety of salt lamps that are available. The Nature Cottage is located at 21 S. Main Street in Lexington. Located just off Old Highway 64 West in Lexington is a true gem, known by many, but often forgotten. Many farmers and their children will remember the days of going to the Davidson County Cooperative Flea Market and Livestock Auction. This was where many would find and buy flea market items, but also where the auction of cattle, pigs, and other livestock was held in Davidson County. Up until 2013, the Farmer’s Co-Op owned and operated the Livestock Auction property. When new owners acquired the old livestock auction barn and property, much of the site’s history is being retained as a facelift and recent revitalization efforts have begun. In 2000, Kevin and Sarah Berkley purchased the Farmer’s Market Flea Market from Grace Fritts. Fritts and late husband, Harold, opened the Farmer’s Market Flea Market over 50 years ago and that property is adjacent to the Davidson County Farmer’s Co-op property. The Berkleys purchased the adjacent Co-op property to expand the Farmer’s Market Flea Market in July 2016. That purchase now allows them to offer more vendor spaces. They are also updating the decaying property to make it more appealing to visitors. “We’re really excited to own a piece of history and make it something enjoyable,” said Kevin Berkley. He recalls that many of the weekly patrons of the Farmer’s Market often share their childhood memories of visiting the auction during its heyday. “This property is a part of history, and even though we’re not originally from Davidson County, we understand the importance of this place for many of the residents,” said Sarah Berkley. When the Berkleys purchased the Cooperative’s property, much work was needed to ensure the safety of visitors and to improve upon the visual appeal. “The day we walked into the barn and property it was amazing. Nothing had been moved from the day they stopped holding the auction,” said Kevin Berkley. The Farmer’s Market Flea Market is said to be one of the area’s largest outdoor markets, according to many of the regular vendors. When you walk through the Flea Market you’ll see anything from household products to one-of-a-kind antiques. Over the years, the market has increased in popularity and started to outgrow its boundaries. Having the opportunity to grow a business in this area and bring more options to a trending industry is really exciting, say the owners. The newly expanded area allows up to 500 or more vendor spaces spanning the property. “The expansion and affordability to rent a space allows a lot of opportunities to bring your yard sales to a location that has good traffic,” said Sarah Berkley. With the addition of new acreage also comes new hours of operation. The Farmers Market Flea Market will now open Fridays and Saturdays beginning in April. The market is currently open on Tuesdays, but offering two additional days each week will allow patrons more opportunities to visit. Farmer’s Market Flea Market is open Tuesday, Friday and Saturday from dawn until all the dealn’s done. The market is located at 366 Livestock Market Road, Lexington, NC 27295. Tuesday rates: $7 open air spaces and $15 covered spaces with 2 tables. Open rates for Fridays and Saturdays: $5 open air spaces and $8 covered spaces with 2 tables. Irish tradition is part of our area with many decedents originating from Irish linage. Here are some traditional Irish staples that are sure to give you the luck of the Irish. Preheat the oven to 350 degrees F. Generously butter 2 (9 by 5-inch) bread pans. Stir together the sifted flour, sugar, baking powder, salt, and baking soda. Cut in the butter and mix very thoroughly with your hands until it gets grainy. Stir in raisins and caraway seeds. Add the buttermilk and egg to the flour mixture. Stir until well moistened. Shape dough into 2 loaves and place in the pans. Bake for 1 hour. Test with a toothpick for doneness. Cool in the pans for 3 to 5 minutes. Transfer to a wire rack to cool. Combine cut up cheddar, blue cheese, and cream cheese in the bowl of a food processor or blender. Add caraway seeds, paprika and beer. Transfer to a serving bowl or crock. Serve at room temperature with crackers or spread on soda bread or hamburgers. Sauté carrots in the olive oil until they start to become tender. Add in the onions and sauté for a minute or two, then add the meat. Season with black pepper and thyme. Cook until browned then drain fat. Add the butter and peas. Sprinkle with flour and stir through. Add tomato paste, wine, and Worcestershire sauce. Let this reduce slightly then add the chicken stock. Allow to reduce down until you have thick, meaty gravy. Season to your taste. Remove from heat. Grease an oven proof dish** (9×13 works best) with butter and add the sauce. Spoon or pipe the mashed potatoes over top. Brush with egg and sprinkle with Parmesan cheese if using. Serve as is or with some crusty bread to mop up that yummy sauce!